TUI Cruises takes delivery of New Mein Schiff 2, a fresh take on a long series of ships from Meyer Turku shipyard. 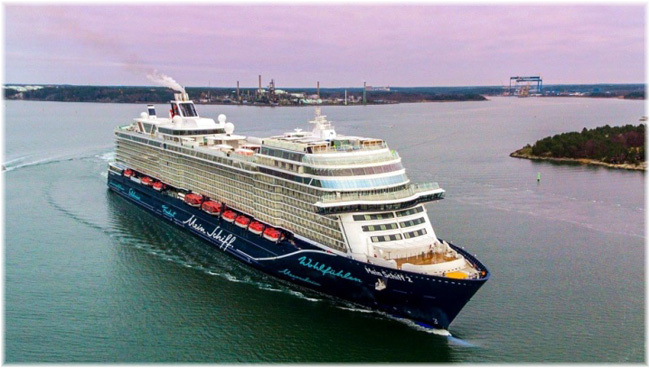 With New Mein Schiff 2 Meyer Turku and TUI Cruises have continued taking into account the feedback from the passengers of TUI Cruise’s previous ships and further improved and refreshed the design of the ship. “For us it has been a thrill working with TUI Cruises on the design and construction of this ship. The passengers will surely notice and hopefully like the differences to the previous ships. We have redesigned many of the areas of the ship, e.g. the Schau Bar and the restaurant area in front of the aft diamond structure”, CEO Jan Meyer says.